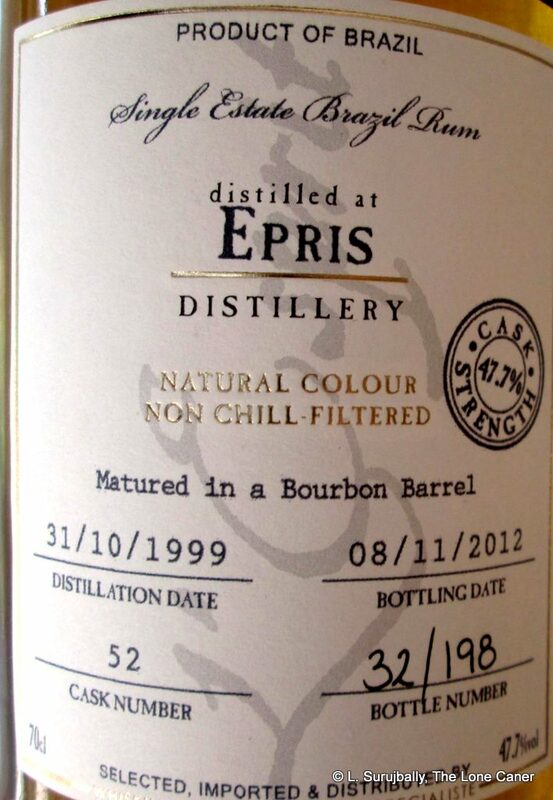 L’Esprit, if you recall, is that little independent bottler in Brittany which is run by Tristan Prodhomme, and has the peculiar distinction of usually issuing the same rums in two iterations – a diluted, more numerous version at a lower proof for the general market, and another more limited one at cask strength (from the same barrel(s) for those who prefer a rum with some fangs. They don’t range too far afield and stick with the regular rums of the pantheon – from Jamaica, Guyana, Trinidad, Barbados, Guadeloupe, Panama and so on, with an occasional divergence to Nicaragua and Belize and Haiti. In the sense that L’Esprit is an independent bottler, they conform to most of the markers of the European indie scene – they regularly buy a few barrels from Scheer, issue a limited bottle set, and have an annual outturn. They’re not out to reinvent the wheel, just to sell good quality hooch. What (to me) distinguishes them is the quality of what they push out the door, and even with the young rums, like this 8 Year Old Jamaican from Worthy Park, the quality of what they selected is self evident. Speaking of Worthy Park: it is located in the parish of St. Catherine, and, like other Jamaican estates, is having something of a renaissance as the wave of tropically-aged, estate-made rums gathers steam – leaving aside Habitation Velier’s rums, they themselves have made quite a few interesting ones of their own (I have detailed files…). Much like Hampden, they pride themselves on cool ester counts and their Forsythe’s double retort pot still delivers in spades when it comes to good rums. Like other Caribbean rum companies, they sell bulk rum abroad (mostly to Scheer), which is something of a double edged sword – other companies capitalize on the WP name and take the value-added revenue for themselves, but on the flip side, it allows WP to have a revenue stream, and introduces a far wider public to the qualities of their rums in a world where distribution arrangements can be a pain for a local company to negotiate. So, given how many Jamaicans are on the scene these days, how does this young, continentally aged 55.9% golden rum fare? Not too shabbily. It’s strong but very approachable, even on the nose, which doesn’t waste any time getting started but announces its ester-rich aromas immediately and with authority: acetone, nail polish and some rubber plus a smell of righteous funk (spoiling fruits, rotten bananas, that kind of thing). Its relative youth is apparent in the uncouth sharpness of the initial aromas, but once one sticks with it, it settles into its own special groove, calms itself down and does a neat little balancing act between sharper scents of citrus, cider, apples, hard yellow mangoes and green grapes, and softer ones of bananas, cumin, vanilla, marshmallows and cloves. The palate was rich as well, no surprises, though again, it started out quite sharp, almost jagged, spicy and hot. 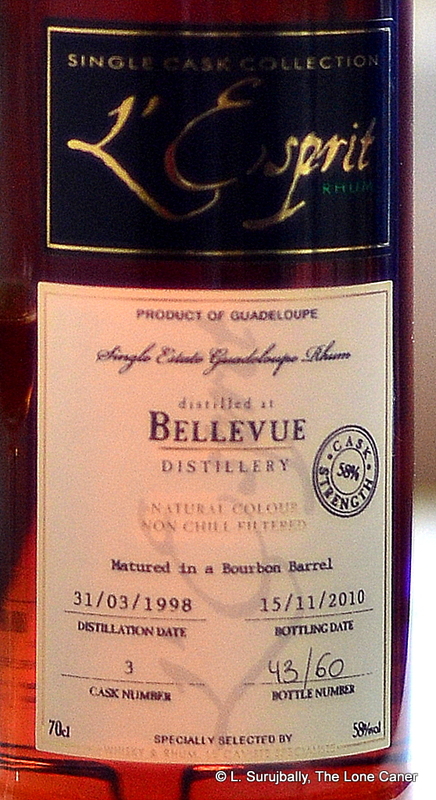 The rum developed from sharp to soft much as the nose did, with many of the same flavours – brine, furniture polish, herbs, brine and olives to start with, green grapes, apple cider, aromatic tobacco and unsweetened dark chocolate, which gradually relaxed into a fruity cornucopia of overripe bananas and mangoes and apricots and guavas and pineapples, all bound up with vanilla, sugar water, a little caramel (very light), crackers, fanta and sprite. As for the finish, that was very good, very long, very fruity, very soft…the slow meandering of a river that started out as a torrent of raging white water but was now serenely pushing out to sea without haste. Overall, I was quite surprised at how much there was going on here. For a rum this youthful and aged in Europe to boot, I expected more savagery and less control, fewer softened edges and more from the sharper side of the barrel. Yet the oak remained in the background the whole while, the fruitiness and funk danced across the senses, and while the complexity and balance were both very well handled, it’s the development of the rum over two hours that held my attention. It started off like a boss and then just…well, it just chilled and showed you a good time. In that it exceeded the Mezan WP 2005 which was older, while falling short of the exceptional Compagnie des Indes Jamaica WP 2007, which was younger. Of the Jamaican rums now gaining greater appreciation, I must confess to my own liking for Hampdens – they’ve consistently scored higher (when taken in aggregate) than Appleton or Monymusk or Worthy Park, of which I have not had that many. That this single rum could make me both discover and re-evaluate that unconscious preference, and encourage me to buy more from the estate – whether independently made or from WP itself, tropically aged or continental – is to the credit of both Tristan who released it, and Worthy Park who made it. It’s a quietly amazing rum that’s really a blast to try. A really good intro to Worthy Park comes from the pen of Steve James, here, as well as the Cocktail Wonk, here. Most of the Worthy Park rums that have garnered attention of late have been the Habitation Velier expressions there are also Worthy Park’s own rums which were issued in 2017 to really positive feedback. Transcontinental Rum Line, Mezan, Rum Nation, Bacardi (Single Cane brand), and some other smaller indies from around Europe have bottled rums from there as well. L’Esprit’s presentation cases of small square 100ml bottles can’t be beat. I’ve seldom seen any minis so sleekly attractive. Let’s move away from Jamaica, Barbados, St. Lucia and Guyana for a bit, and go back to a company from Haiti and an independent bottler out of France for whom I have a great deal of respect and affection: Barbancourt and L’Esprit respectively. 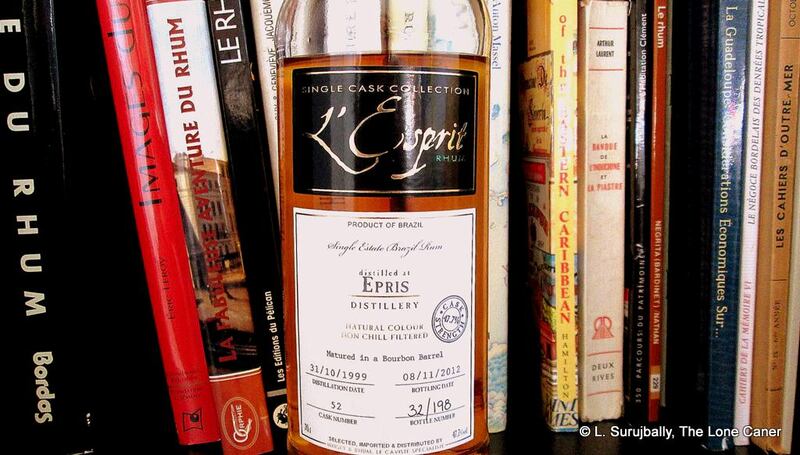 L’Esprit, as you may recall from its brief biography, is a small outfit from Brittany run by Tristan Prodhomme, who has the smarts to issue all of his rums in pairs – one version at cask strength in a small outturn from the barrel, and the remainder (usually from the same barrel) at a diluted 46%, aimed at the somewhat more sedate rum drinkers who prefer not to get their glottis ravaged by something north of 60%. That this kind of canny rum release has real commercial potential can perhaps be seen in Velier’s 2018 release of the twin Hampden rums with a similar paired ABV philosophy. 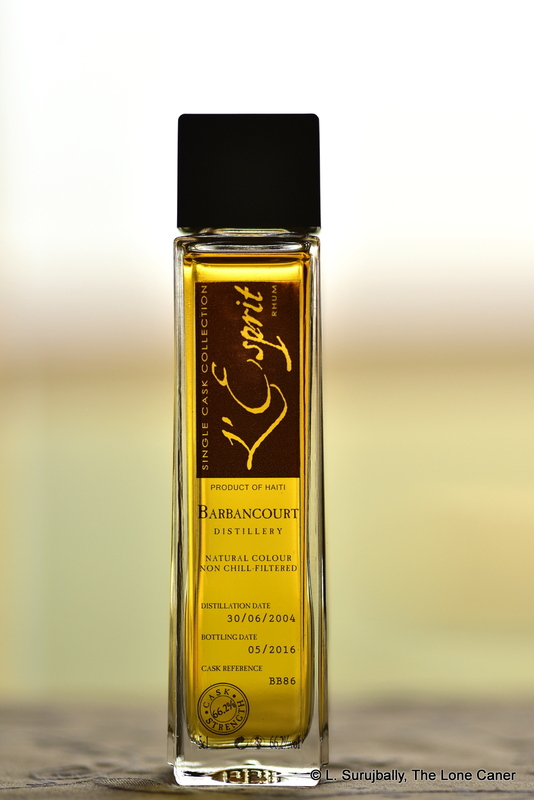 Even if you include the clairins, Barbancourt is the best known name in rum out of Haiti, and perhaps the most widely appreciated rum from the half-island by dint of being the most easily available (and affordable). It’s usually the first Haitian rum any new rum explorer tries, maybe even the first French island rum of any kind (though they are not referred to as agricoles). Over the years they have, like many other estates and distilleries, sent rum to Europe in bulk in order to keep themselves afloat, though for some reason indie bottlings of Haitian rums aren’t quite as common as the big guns we all know about – perhaps they send less stock over to Scheer or something? The rather dry-ish taste was an odd experience, somewhat at an angle to what could be expected after smelling it: for one thing, it was more briny, and for another it actually had hints of pimento and pickled sweet gherkins. What distinguished it was its heat and uncompromising brutality. The flavours – which after a while included brine, florals, rubber, petrol and a meaty sort of soup (and we’re talking strong, simple salt beef here, not some delicate Michelin-starred fusion) – were solid and distinct and took no prisoners whatsoever. That it also presented some sweeter, lighter notes of white fruit (pears and white guavas for example) was both unexpected and welcome, because for the most part the thing was as unsparing and unadorned as congealed concrete – though perhaps more tasty. As for the finish, well, that eased off the throttle a tad – it was sharp, dry, long, briny with more of those light florals, fruitiness, nail polish and freshly sliced bell peppers, and left you in no doubt that you had just tasted something pretty damned huge. At this stage in the review I could go off on a tangent and ruminate on the difference between continental and tropical ageing, or how the added commercial value moves away from poor islands of origin to European brokers and independent bottlers, with perhaps an added comment or two on Barbancourt’s history, L’Espirt itself, and a witty metaphor or three to add to those already expressed and tie things up in a nice bow. Today I’ll pay you the compliment of assuming you know all this stuff already, and simply end the review by saying this rum is quite a flavourful beast, exciting the sort of admiration usually reserved for the sleek brutality of an old mechanical swiss watch. It’s delicate even within its strength, clear, dry, and perhaps excessively eye-watering and tongue-deadeningly intense to some. But even though it’s jagged as a blunt cutlass, my personal opinion is that it does Haiti and Barbancourt and L’Esprit no dishonour at all, and is a hell of a full proof drink to savour if you can find it. The surprisingly heavy and dark Bellevue rhum made by L’Esprit purred salt and sweet caramel ice cream into my nose as I smelled it, revealing itself in so incremental a fashion, with such an odd (if excellent) profile that it almost had to be experienced to be properly appreciated, and it left me wondering whether this was a molasses rum, not one from cane juice. It was bottled at the perfect strength for what it displayed, melding power and smoothness and warmth in a nose of uncommon quality. Yet there was lightness and joyousness here too, a sort of playful melange of all the things we like in a rhum, skimping not at all on the secondary notes of prunes, plums, peaches, and pineapples. It was plump, oily and aromatic to a fault, and demonstrated quite forcefully that the Epris Brazilian rum that had been my first introduction to the company had not been a one-off, one hit wonder. Even to taste it, the experience did not falter or withdraw from its exuberance. The Bellevue seemed to operate on two levels of quality simultaneously – first there were the faint oily, rubbery notes, leavened with nougat, pink grapefruit and light citrus. And behind that, almost at the same time, there was the real deal: honey, vanillas, olives and briny notes in perfect balance, chopped light fruits and flowers, plus a thin thread of licorice coiling through the whole thing. There was just so much going on here that it rewarded a rather languorous approach to the tasting – usually I do all my tastings at the table with all the comparators within easy reach, but here, after ten minutes, I simply said “to hell with it” and went out onto the balcony, sat down to watch the sun go down, and idly observed the passers by below who didn’t share my good fortune at having a lovely rum like this one growling softly in my glass. Even the finish kept on developing (not always the case with rhums or rums) – it was crisp and smooth and hot, long lasting, a real delight – it seemed to be a little more oaky than before, here, but the lasting memories it left behind were of a lot of hot, strong black tea, and burnt sugar resting easily on a bed of softer vanilla, tobacco and citrus notes. It was, and remains, a solid, smooth, tasty, drinking experience, not quite as good as the Damoiseau 1989 20 year old…but close, damned close. If you’re one of the fortunate owners of this nectar, let me run down the bare bones so that you know what you’re drinking: column still product, cask strength 58%, matured in a bourbon barrel for slightly more than twelve years. This is not from the Habitation Bellevue distillery on Marie Galante, but from the Bellevue estate which is part of Damoiseau on Guadeloupe (the main island), founded in 1914 and bought by Louis Damoiseau in 1942 – commercial bottling began around 1953. Like just about all commercial spirits operations in the West Indies, they ship bulk rum to Europe, which is, as far as I know, where this one was bought, so ageing was not tropical, but European. Which, fortunately for us, didn’t diminish its achievement in the slightest. My association with L’Esprit, that little French company from Brittany I wrote about earlier this week, came as a consequence of that Brazilian rum referred to above — that thing really impressed me. 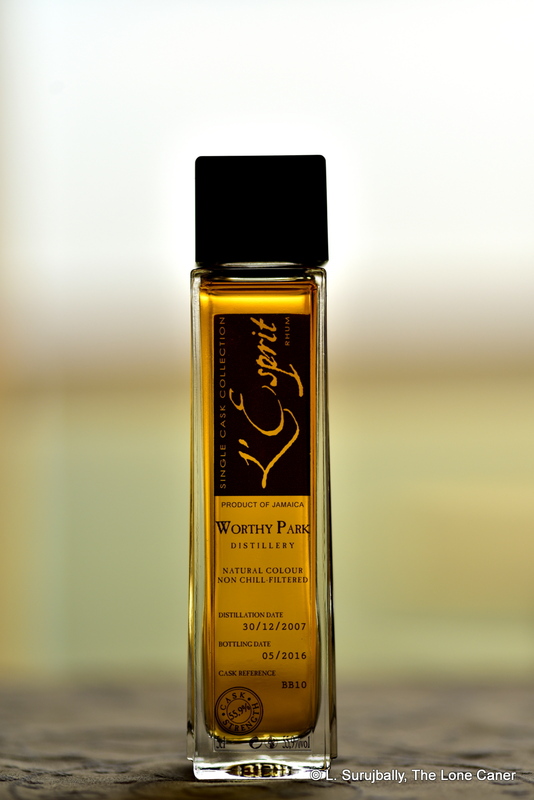 And so I kept a weather eye out, and bought the first bottle made by L’Esprit that I saw, which just so happened to be this one…I have a few others from the company to go through so it won’t be the last either. 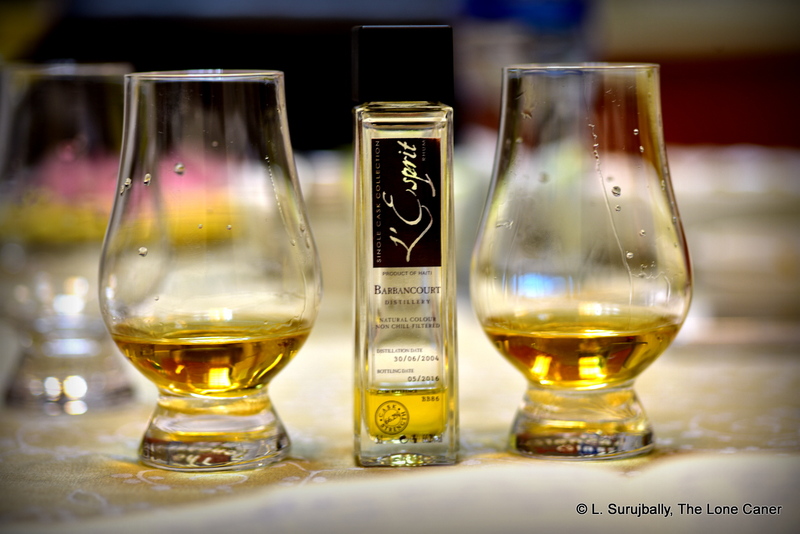 While thus far L’Esprit hasn’t made a whole lot of rums – twenty five or so the last time I looked – the worth of their wares is consistently high. This one is no exception, an enormously satisfying rhum with exclamation points of quality from start to finish. The minimal outturn should come in for mention: I’m used to seeing a “set” of a few hundred bottles from the various indies, a few thousand from Rum Nation, so there’s a fair chance some reader of this little blog will pick one up…but to see one of merely sixty bottles from a single cask, well, I may just be spitting into the wind (it was beaten, for the trivia nuts among you, by the Old Man Spirits Uitvlugt, a measly twenty eight bottles, and by the reigning world champion, the Caputo 1973 which had just one). The reason why the outturn is so relatively small, is because L’Esprit is bowing to the market – they know it’s mostly connoisseurs who love cask strength rums, but they’re few and far between, and it’s the general public who drive sales and buy the 46% versions. What Tristan does, therefore, is issue a small batch of cask strength rums from the barrel (60-100 bottles) and the remainder gets tamped down to 46% and issued in 200-300 bottles. After going head to head with as many agricole rhums as I can lay paws on for the last few years, there’s nothing but good I can say about the tribe as a whole. I enjoy the fierce purity of the AOC Martinique rhums, their almost austere clarity and grassy cleanliness – yet somehow I find myself gravitating towards Guadeloupe a bit more often, perhaps because they have a slightly more experimental, almost playful way of producing their hooch (they never bothered with the AOC certification themselves, which may be part of it). This gives the rhums from the island(s) a certain unstudied richness and depth that seems to have created a bridge between traditional molasses rums and agricoles (my personal opinion). 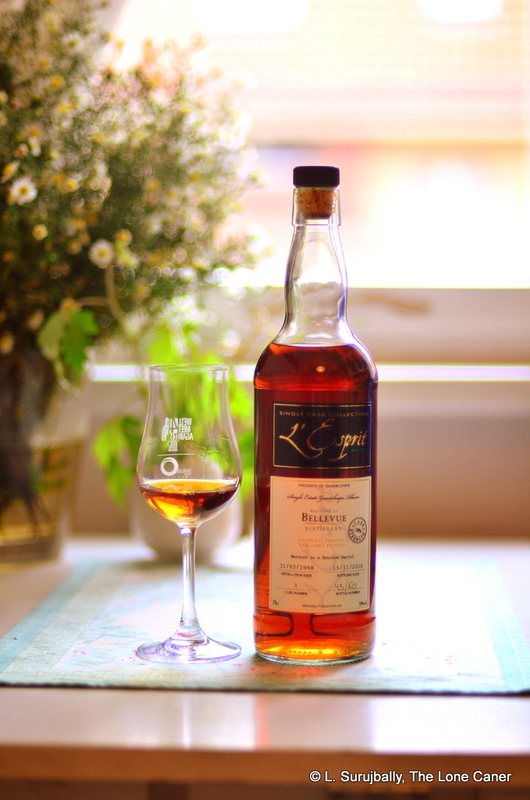 If you can accept that, then this Bellevue rhum demonstrates – in its fruity, oily, creamy, complex, balanced and warm way – the potential and quality of the best of both those worlds. A last pic: Yeah, it’s out of focus and photobombed by The Little Caner…but we could all use some cheer and smiles once in a while, and I liked this one a lot anyway. L’Esprit is a small French brand founded by Tristan Prodhomme of mixed Welsh, Scottish and Breton ancestry. His biography is about as interesting as any I’ve come across. Strictly speaking, he and his small operation are not into rhums, but whiskies (which miffs me, because I think their relative importance should be reversed, but I can’t have everything, so…). Somewhat like Don Jose Navarro of Havana Club who gained a degree in thermodynamics and then turned to distilled spirits, Tristan majored in Philosophy before evincing a strong interest in the obscure Scottish tipple, although to that point he had been no more than a dabbler in the field – in other words, he drank it. 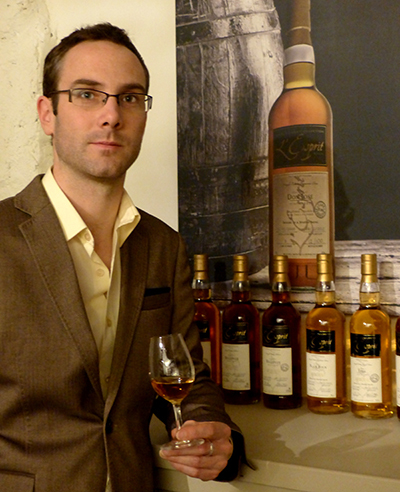 In 2003, needing to finance a holiday in Scotland, he ended up working at The Whisky Shop in Edinburgh, and much to his own surprise, did not return to France (Brittany) for four years. 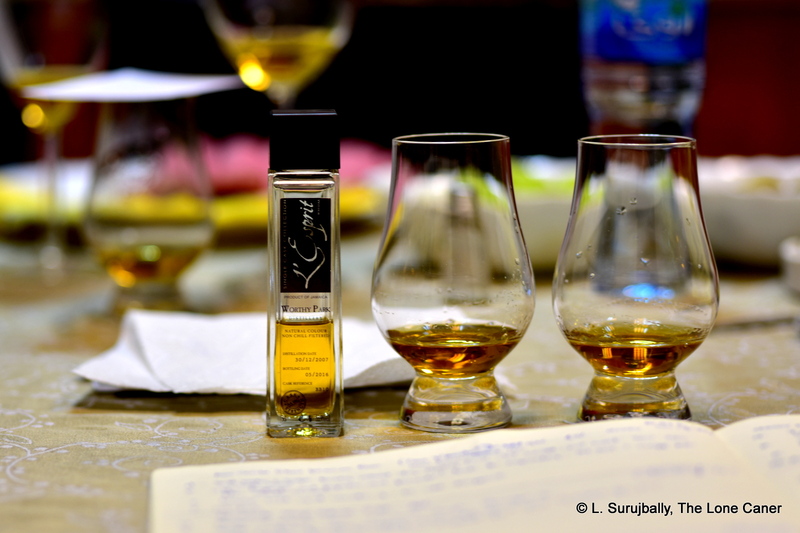 In that time he gained a wealth of experience about the different kinds of whiskies, tasting and selecting and buying them, and something about the fundamentals of the business as a whole. By 2007 he was straining at the leash and wanted to return home. Moreover, he wanted to expand the selection of whiskies available to the French consumers, and he simply could not fathom why, with such a large scotch-swilling population, there were so few stores dedicated to their sale. He was confident enough by then to feel he could start up his own shop, and set about doing so. Somewhat like Nine Leaves but without the still, Tristan opened up Whisky&Rhum with his partner, and became the owner, purchasing agent, sales manager, accountant, secretary, designer, webmaster, deliveryman, carpenter, independent bottler, all in one (or two, depending on how you look at it). Calling himself a specialist, not a generalist, he kept his shelves stocked with what he himself had selected, rather then going on buying sprees and shelling out for everything in sight, a practice of which he disapproves. This way, one infers, he gets to be able to recommend everything he sells, and knows it by its first name, which may keep sales smaller than an “everything is here” establishment, but permits him to stand behind each and every product he stocks. Some years later, Tristan remembered his own personal reference rum, the Rum Nation Guatemala 23 year old (for which I have myself been searching for years – it’s one of their earlier bottlings), and in thinking about it, wondered why rum was not as commercialized, or even as well known, as the whiskies were. Rum had, at this time, just started to take its first real baby steps into its own renaissance, helped by many new bloggers who had become active around this point and were raising the profile of the spirit around the world. Single-cask full-proof rums “back then” were making small splashes but few ripples, helped along by indies such as Renegade, Silver Seal, Moon Imports, Rum Nation, Fassbind, Samaroli and a few others (in spite of its age, Velier had not yet penetrated the mainstream and changed the game…that came later). But, like others before and after him, Tristan thought that rather than mass produced 40% bottlings everyone drank, he could do better, bootstrapping his experience with The Whisky Shop which also produced their own such variations, the quality of which was always above-par. With this in mind, in 2010 he launched the marque of L’Esprit (“the spirit”, or, “the mind”, which kind of makes sense, right?) with two whiskies and a single rum. In the following years, for his rums and rhums, he bought one barrel at a time – from brokers, not distilleries, so primarily aged in Europe – and spent time ensuring that what he put on the shelf was something he personally enjoyed. Because his establishment was still small, he didn’t go the Rum Nation route and never issued hundreds of cases of the rarefied juice at a time, spread out over the entire world. His expectation and strategy was more modest, and stayed at single casks, at most a couple hundred bottles, and to this day you’ll have to do some legwork to find one outside of Europe in general, and France in particular. 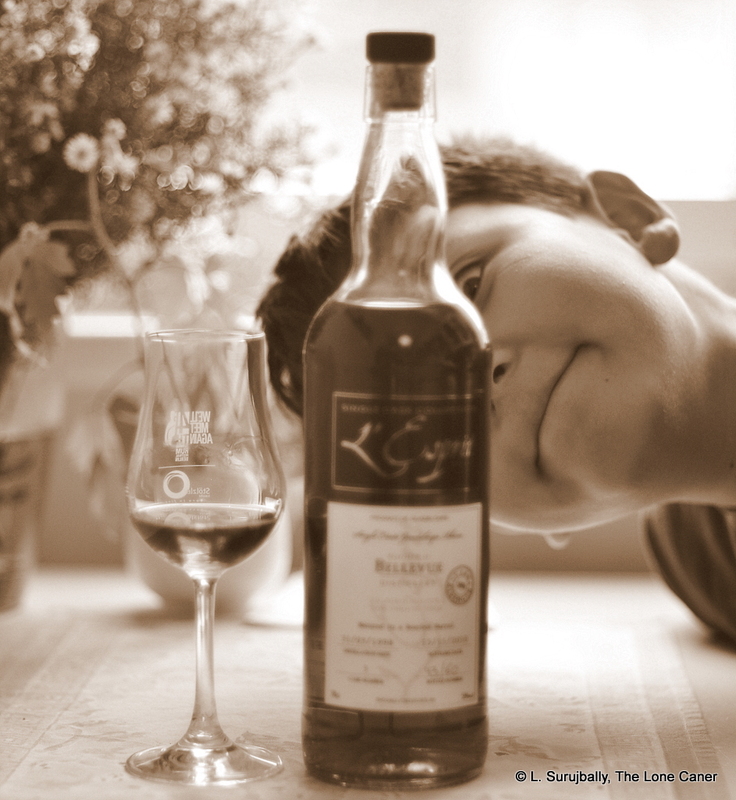 Of course, it’s still whisky that dominates his interest, but in quiet corners of the rumiverse where the grog-blog boys hang out, there are growing whispers that the man makes a decent rhum and it might be worth getting them while they last. While eschewing filtration and additions of any kind, Tristan doesn’t really go in for the full cask strength experience, preferring to tame the beasts with water – this is why most of his sample kits have a sample bottle with water included. He believes that dilution is perfectly fine, since “It works!” – it brings out subtler flavours in the spirits, permits perfumes, smokiness, the quieter notes, to shine and become more evident; high-power intensity often masks these. As a consequence, he prefers a range of 45-50% in his bottlings, though in recent years, bowing to the wishes of the market, he has produced rums that are stronger, always in lots of a hundred, from the same barrels as the lower proofed ones; he noted in an interview that while this is what other shops wanted from him, his own experience was that 46% rums sold much better and were also better value for money in his own estimation, so he produces both. A proponent of terroire, he doesn’t blindly follow that as a lodestar, and selects the casks he buys primarily because of his notion of their quality, and his own judgement. That judgement seems to be quite solid: he’s issued rums from Brazil, Belize, Guadeloupe, Trinidad, Barbados, Haiti, Guyana and Jamaica (all the old stalwarts, I like to joke), and it’s likely that as his reputation and brand becomes better known, he’ll expand and go to other countries, issue different variations. Already he has an arrangement to have La Maison de l’Hédonisme distribute his bottlings (including the other drink), and it’s probably just a matter of time before we see more. There are two shops now, one in Rennes an another in Vannes. 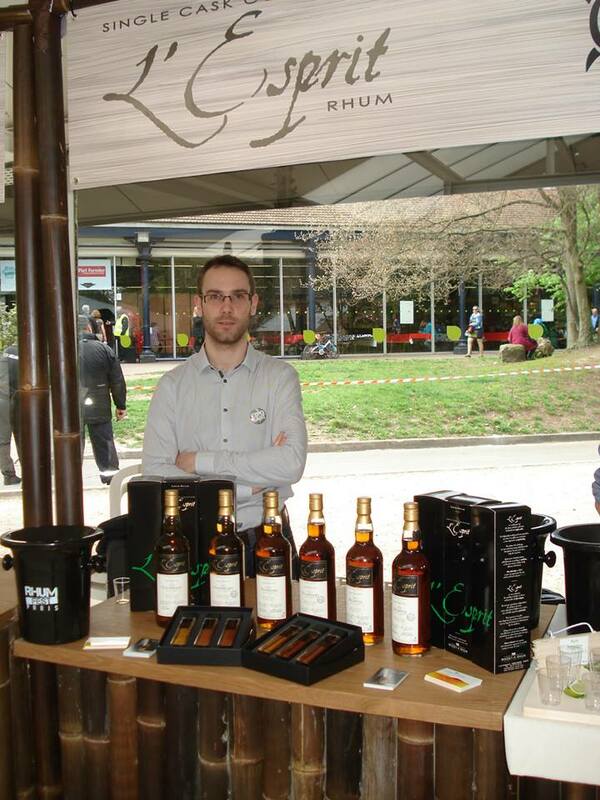 DuRhum, ever ahead of the curve, did a feature on the company in 2013, the Rumporter magazine featured his rums twice, Serge of WhiskyFun has consistently rated the rums well (the Caroni got a 91), he was at the 2014 Paris Rumfest showing off his stuff, and there’s no doubt more is coming. Independent bottlers are not as rare as four years ago when Cyril first wrote about this tiny company and many are much better known. Most dip from the same well in assembling their single-cask, fullproof rums and rhums – what to some extent marks Tristan out from the others is the slow, patient way he has of improving those casks he buys, incrementally expanding the range and the quality each time. If the mark of any independent bottler is how much we want to source the earlier rums they made at the beginning of their careers (like Rum Nation’s 1974 Demerara, or Velier’s Skeldon 1973), then I believe that we should pay some attention to L’Esprit as well. This is a company that, small or not, has potential to grow into something bigger in the years to come, a journey in which I at least, wish the man a lot of luck. Laurent Cuvier of “The Rums of a Man with a Stroller” fame, ran a number of these rums past each other in a two part tasting session here and here (in French). Well worth a read. The list of rums issued as of January 2017 is below. I’m fairly certain this is most of them.